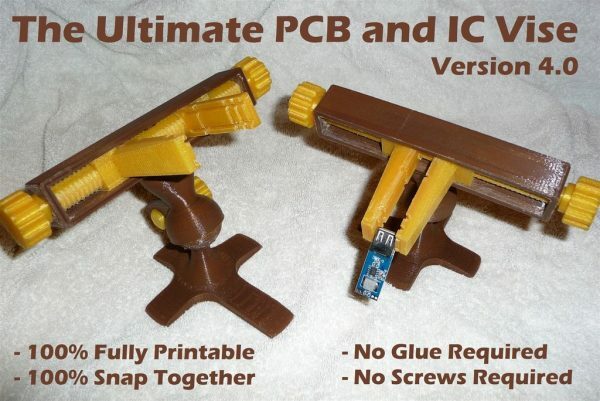 Ultimate PCB and IC Vise – 3D Printable Vise #3DThursday #3DPrinting « Adafruit Industries – Makers, hackers, artists, designers and engineers! This 100% fully printable PCB and IC Vise project is my personal remix to the original “Fully Printable PCB Vise” by sneakypoo, with some mods made by other people, and a few of my own personal mods. This vise is PERFECT for holding Printed Circuit Boards (PCB), Integrated Circuit (IC) boards, and/or any other small electronics. The vise is useful for soldering or working with these circuit modules. The vise is 100% printable and should be easy to print on most 3D printers with a 200mm X 200mm print bed. Most importantly, this vise can be assembled without any glue or screws – you just snap the vise together and it is ready to use!